Dr.Sorsky and his staff are wonderful I am very happy with him and the girls in the front they were very good to me and went out of their way to make sure I was comfortable and taken care of!!! And they made sure that I got the frames I wanted and liked!! Great place to go if u need an eye doctor I highly recommend it to anyone!! Really like this place everyone is nice! 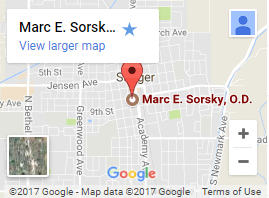 I highly recommend Dr. Sorsky. He is very knowledgeable in his trade. He keeps up with current diagnostic practices. He was able to diagnose a congenital condition that my son has that no other doctors noticed. He is very professional and courteous.